Multiple Offers on Downtown Condos Plummet. Prices fall 5%. There’s been a lot of questions lately asking me how the condo market is doing. Especially since the announcement of the latest lending policies. I wrote a post last week How The Stress Test Could Curb Demand. While it’s still too early to tell if I’ll be right there are clear signs of a slowdown. I’ve said it before, and i’ll say it again. Condos will not be exempt from any sort of correction if the market turns. Think about it, if a detached house and or townhouse price comes down what would be the value in buying a condo? So what am I seeing with downtown condos? A huge drop in multiple offers. Or, rather a huge drop in condos selling over asking price. 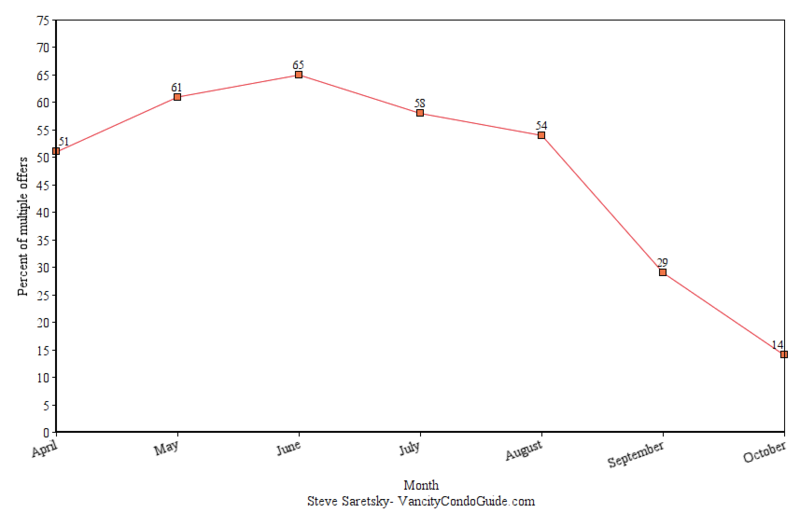 So downtown condos went from 65% of condos selling over asking price in June to a measly 14% in October. It should come as no surprise that multiple offers drive prices way up. You get into a bidding war, you get competitive, and your emotions get the better of you. The winning buyer almost always overpays. Perhaps a coincidence that as the number of multiple offers dropped the prices followed? 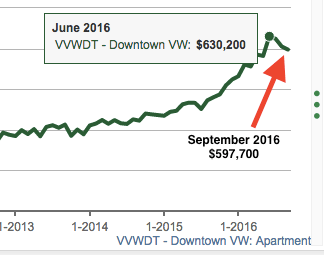 The chart above shows Downtown Vancouver condo prices have dropped 5% since June. This was determined using the boards benchmark. Even using median sales price shows a 7% decrease. It appears sanity is being restored to the downtown condo market.